I am back from a week on Galiano Island, and I feel both rested and reinvigorated! My wife and I rented a beautiful log cabin on the north end of the island for our stay, and I set up a pretty inspiring makeshift studio on the upper floor while we were there. The upstairs of the cabin was designed as an open-concept loft, and although many of our days were foggy or rainy, I took full advantage of the vaulted windows and managed to finish off a new (and rather large) painting in time for the LOOK Victoria submissions this past Sunday-- the day we returned home. 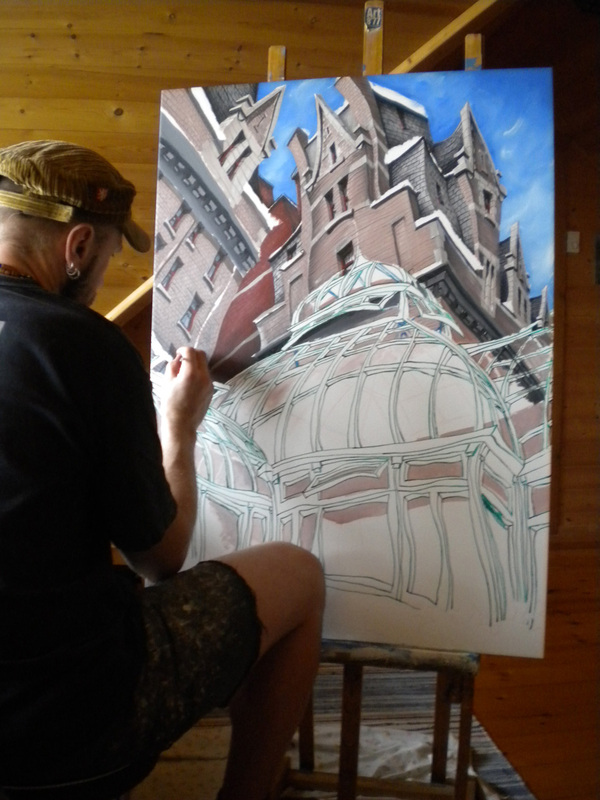 Three large, triangular windows were just behind me while I worked on my Victoria Conference Centre Pavilion painting. Image copyright Martin Machacek 2011. My new painting is of the Victoria Conference Centre Pavilion and measures 28" x 39" unframed-- even larger than my epic Johnson Street Bridge painting! Prior to tackling the glass dome of the pavilion itself. Image copyright Martin Machacek 2011. I am pretty thrilled with how it turned out in the end, though there were definitely stretches of time when I wasn't sure if I would be able to complete it in time for the LOOK Victoria submission deadline. The size of the painting was one issue in itself, but the amount of detail involved with this piece definitely made it a challenge to finish in a relatively short period of time. 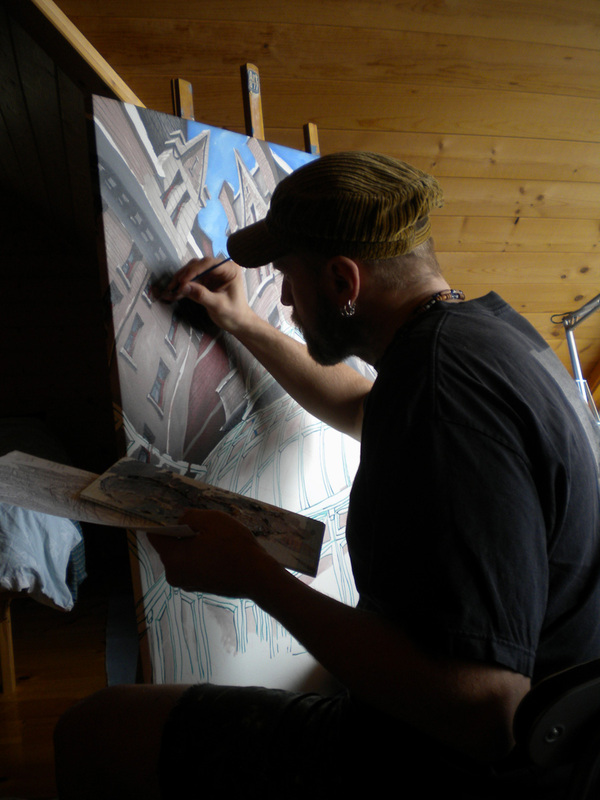 Putting the finishing touches on the bottom of my painting, well into Saturday night before the submissions were due! I don't even have a photo of the finished painting yet, as I needed to drop it off right when we returned to Victoria. Image copyright Martin Machacek 2011. I particularly enjoy the stark contrast between the modern green-glassed dome of the Conference Centre in the foreground with the historical and weathered sandstone of the Empress Hotel, which is looming overhead in the background. I submitted this new painting, along with my classic Johnson Street Bridge original, to this year's LOOK Victoria exhibition. I encourage all of you to come out for the opening event or to check out the exhibition during its month-long tenure at the Bay Centre mall. I've provided the details below and hope to see some of you there! Happy New Year From Martycultural Art! Happy belated new year, everyone! :) I hope all of you had a restful and rejuvenating holiday season. The past few months have been both busy and inspiring for me, as usual. 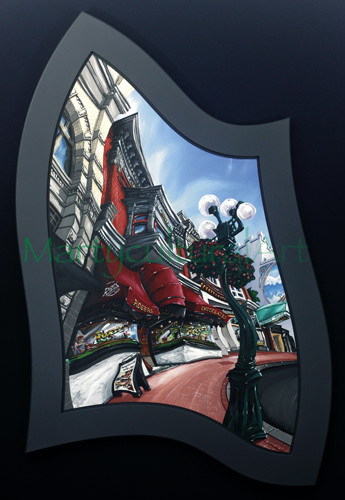 After taking about a month off in November to recover from a bustling season selling artwork on the Causeway, I finally finished some new pieces, including a commission of a client's home as well as an intricate rendition of the flagship Rogers' Chocolates heritage store on Government Street! 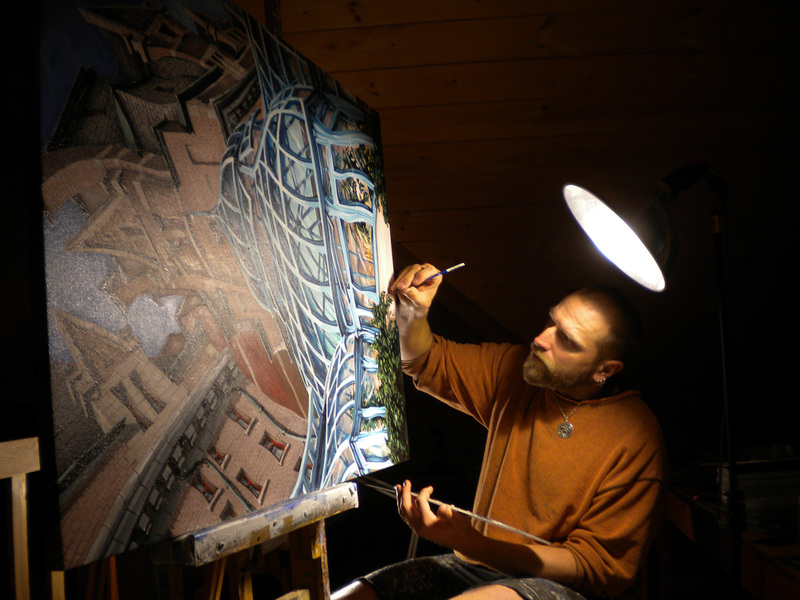 I am nearing completion on several other new paintings as well now, including a night time scene of the Church of St. John the Divine to help commemorate its 100th anniversary. For the next week or so, I will be attempting to start and finish a rather large painting in time for the annual LOOK Victoria show submission deadline. (I have other back-up pieces to submit in the event that I don't meet this admittedly ambitious goal.) 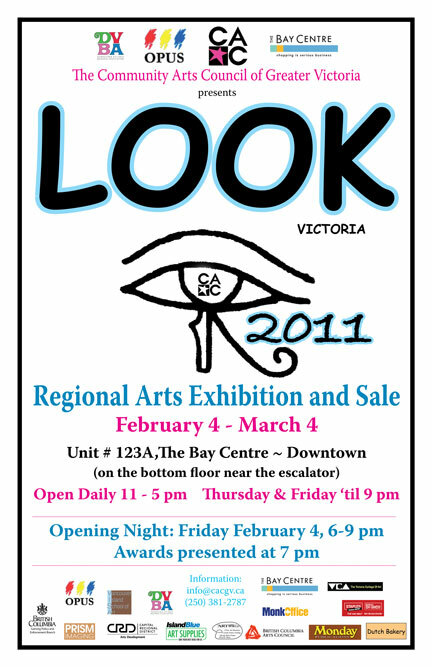 I was unaware of the LOOK Victoria show in past years, and I am very excited to have some of my paintings be a part of the exhibition this year! Next week, I head to Galiano Island for the first time ever to celebrate a milestone birthday of my own, and then I'll be hard at work again in the studio come February! All the best to you all in 2011! 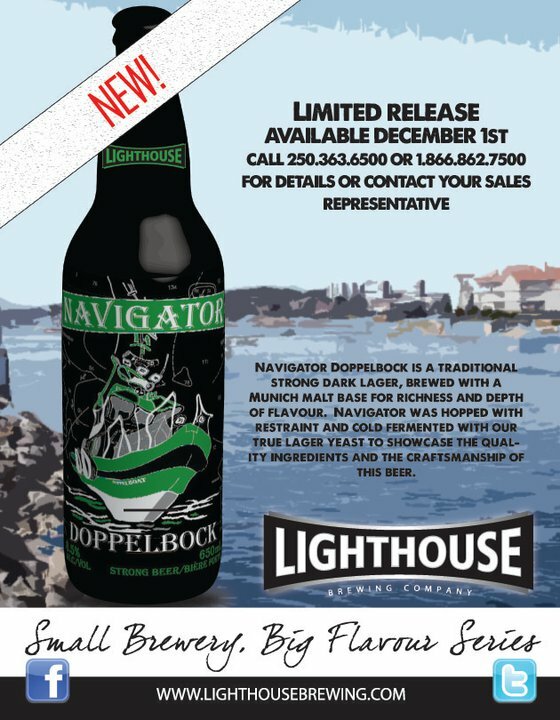 I am very excited to announce that the new specialty brew from Lighthouse Brewing Company-- Navigator Doppelbock-- is now available in select private liquor stores in Victoria, Vancouver, and across Vancouver Island. As I mentioned in my last post, Lighthouse offered me the opportunity to design the label for this beer, and I thoroughly enjoyed the process and the chance to do something a little different with my artwork. 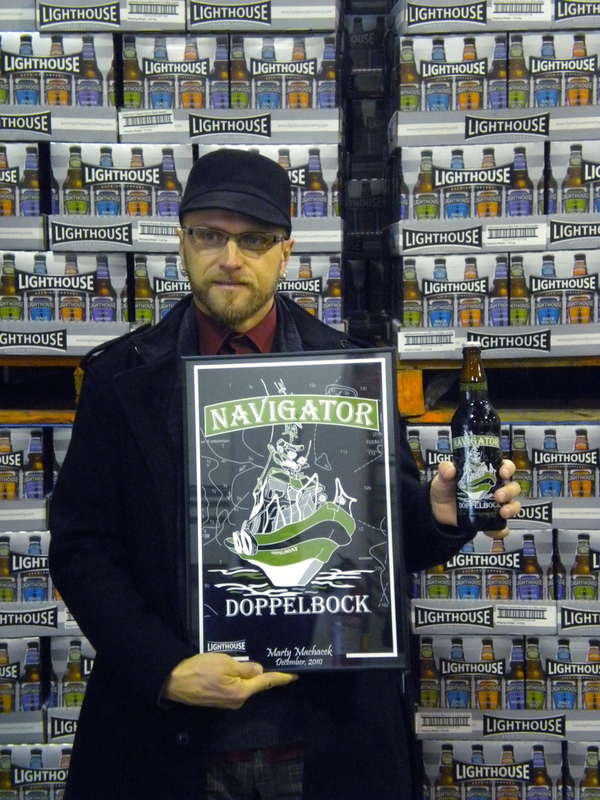 Posing with my artwork and one of the freshly-filled beer bottles at Lighthouse Brewery yesterday. As the "Small Brewery- Big Flavour" series continues to grow, the brewery will amass quite the collection of original artwork from local artists! 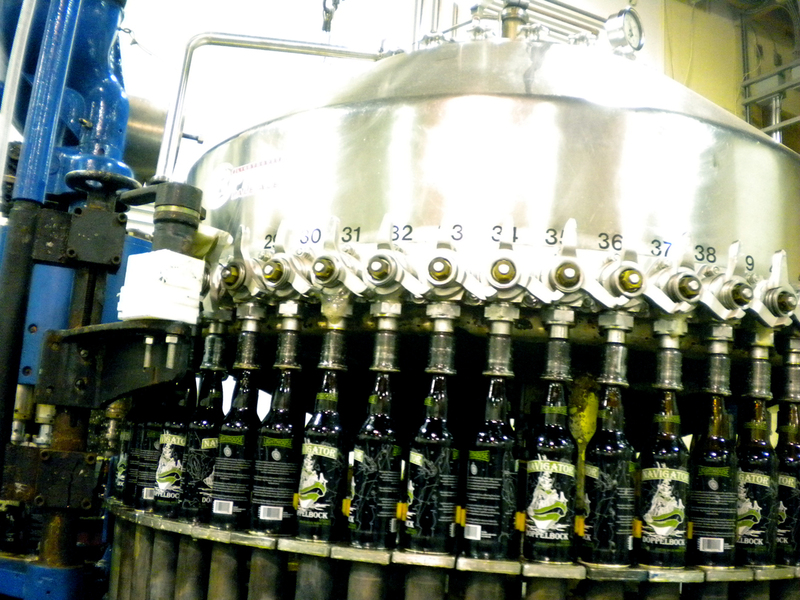 Yesterday, I was able to go to the brewery and see the bottles being filled and prepped for shipment to the liquor stores. (Yes-- they are in the stores already and they were only filled yesterday morning!) It was pretty surreal to see all of the bottles (5000 in total) moving along the conveyor belts-- all of them with my design on them! The team at Lighthouse was very excited yesterday as well. They are truly passionate about crafting specialty beers and also about supporting local artists in the process. This machine slowly fills 50 bottles at a time. Once they are filled close to the top, they are machine-capped and sent to a different part of the conveyor belt to be cased. I had my first taste of the Doppelbock this evening after a long day of work, and I was happily surprised to discover that it tastes very similar to a Czech beer- delicious! Feedback on the beer so far has been extremely positive, so don't wait too long to pick some up for yourself. Enjoy! Thanks again to Lighthouse Brewery for this amazing opportunity! 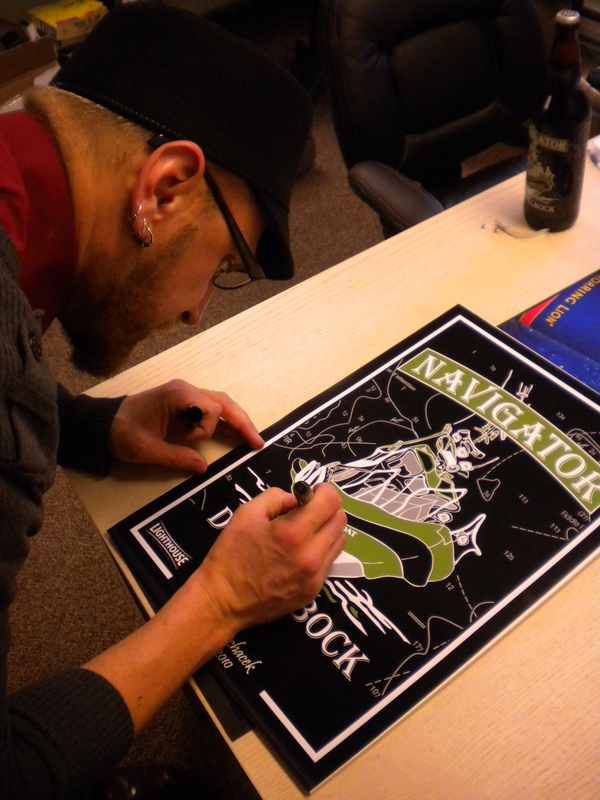 For all of you beer lovers in the Greater Victoria and Greater Vancouver areas, be sure to check out the release of Navigator on December 1st, 2010! 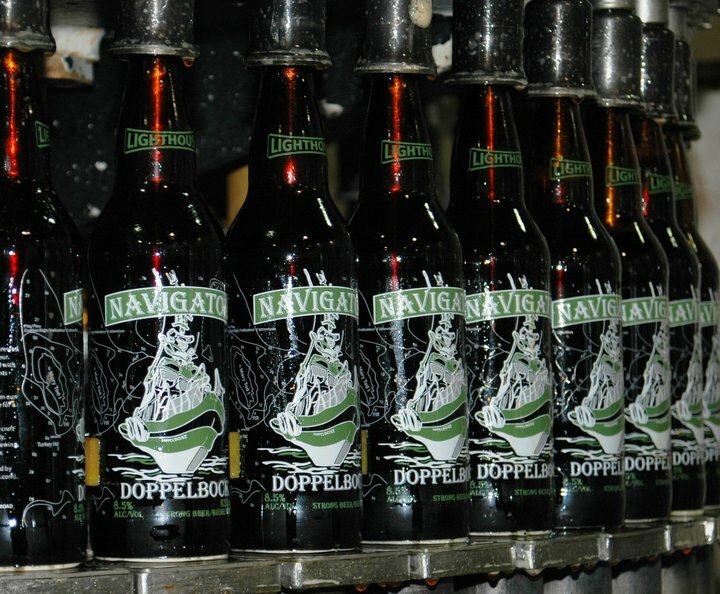 Navigator is a traditional Doppelbock lager and was brewed to perfection by the great people at Lighthouse Brewing Company here in Victoria. Navigator is the second beer created for Lighthouse's "Small Brewery- Big Flavour" series, and I was thrilled to be selected by Lighthouse to design the label for this beer! The bottles are unique in that they are 650mL and that the 'labels' aren't actually labels at all. Instead, the image has been silk screened directly onto the bottles, making for a polished and classy look. For this lager, we decided on a tug boat image and set it against an actual nautical chart from the Victoria area. It was a great experience to collaborate with Lighthouse Brewery on this project and kudos to the company for their committed support of local artists! Hello, everyone! 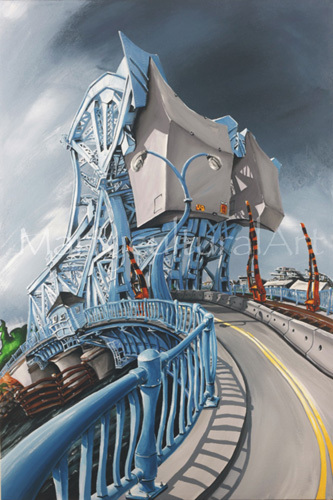 I'm excited to announce that my painting of the Johnson Street Bridge will be included in the upcoming Blue Bridge Art Show, which has been organized by johnsonstreetbridge.org. Timed to precede the upcoming referendum in Victoria, in which citizens will be asked whether they support the city borrowing over $49 million to replace Big Blue, the show will feature Blue Bridge artwork in a variety of media and will run from November 12th to 20th. My original painting will be on display; however (as most of you are aware) it will not be offered for sale. For those of you who are interested in owning a full-sized reproduction of my painting, a limited number of giclées on canvas have been produced and will be available for purchase through the Blue Bridge exhibition. Full details about the available sizes and respective prices can be found on my main website here. I have been looking forward to this event for what feels like a long time, and I'm curious and excited to see what sorts of art pieces will be at the exhibition. The Bridge is a natural conversation piece-- for people who love it or hate it-- and I can't wait to see other artists' interpretations of it! The art show opens on Friday, November 12th at 7 pm and takes place at Studio 16 & 1/2 in Fan Tan Alley (between Fisgard Street and Pandora Avenue). I invite you to come to the opening event and mingle with the artists; otherwise, the show runs in Studio 16 1/2 until Saturday, November 20th. You can RSVP directly for the opening night through Facebook here.